51 years. Passed away suddenly Tuesday 26.3.19, QEII. Loving and devoted husband of Gina and father of Travis, Nathan and Luke. Son-in-law of Ross and the late Erica Ayre. 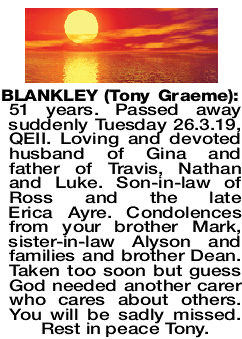 Condolences from your brother Mark, sister-in-law Alyson and families and brother Dean. Taken too soon but guess God needed another carer who cares about others. You will be sadly missed. Rest in peace Tony. To dear Gina, Travis, Nathan and Luke, our very deepest sympathy. Gone too soon. Love Aunty Lorraine, Uncle Bill. 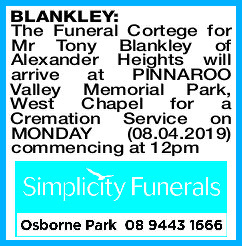 BLANKLEY TONY Our sincere and heartfelt condolences to all the family. Tony was a dedicated friend and colleague who always gave the very best of himself. You will be sadly missed by the staff and customers of Avivo.